In the previous post I began to provide a rationale for an alternative translation to Hebrews 9:16-18. And in two posts before that (here and here), I provided an outline of the literary structure of the very center of Hebrews. In this post I will be building off those three successive posts, attempting to provide some more support for the translation below and it's importance in context. For where a covenant is, it is necessary that the death of the covenant-ratifier be brought forward. For a covenant is confirmed upon dead bodies, otherwise it is not valid at all while the covenant-ratifier is alive. Therefore not even the first covenant was inaugurated without blood. For where a covenant is, it is necessary that the death of the institutor [of the covenant] be carried [by a priest].1 For a covenant is established over dead [animal] victims, otherwise [the covenant] is of no strength at all while the institutor is alive. Therefore not even the first [covenant/priestly ministry] was inaugurated without blood. Saint Augustine once commented on these passages, and his interpretation was that the "likeness" of "Christ's death for us" is presented here. But this "likeness" to which he was referring was "the old covenant, in which the death of the testator was prefigured in the sacrificial victim. "2 No scholar to my knowledge denies that in these passages (i.e. Heb. 9:16-18) the author of Hebrews is leading his audience to see "Christ's death for us". All scholars interpret these passages in a way which illustrates Christ as the one who dies as a sacrificial victim in order to bring about the change of law "necessary" (Heb. 7:12) for the old covenant to become obsolete (Heb. 8:13). But instead of interpreting Heb. 9:16-18 as an illustration of the priestly ministry and it's essential sacrificial system which must necessarily fade away once Christ offers himself as a living sacrifice for sin in the the "true tabernacle" (Heb. 8:2; 9:11), many scholars treat these passages as a direct reference to the literal death of Jesus. Allegedly, Jesus had to literally die (as a sacrifice for sin) in order for some figurative "will" or "testament" to go into force. But is this really what is going on? And what does it even matter if it's not? As I have argued in previous posts, a "will" or "testament" is not in view at all in these verses. Instead, I contend, the author is illustrating the way in which a covenant was ratified under the old priesthood and ministry, which foreshadowed both the work of Jesus as a sacrificial victim and the Priest who mediates between God and man (i.e. God and the covenant-ratifier). At first glance the difference might appear to be too nuanced, leaving the bottom-line of the author's argument to be that someone needs to die in order for the covenant to be ratified (or the "will" to go into force). But I am arguing that there is a major difference between the two arguments. And I'm not quite sure why many scholars consider the translation of this passage to be a moot point. 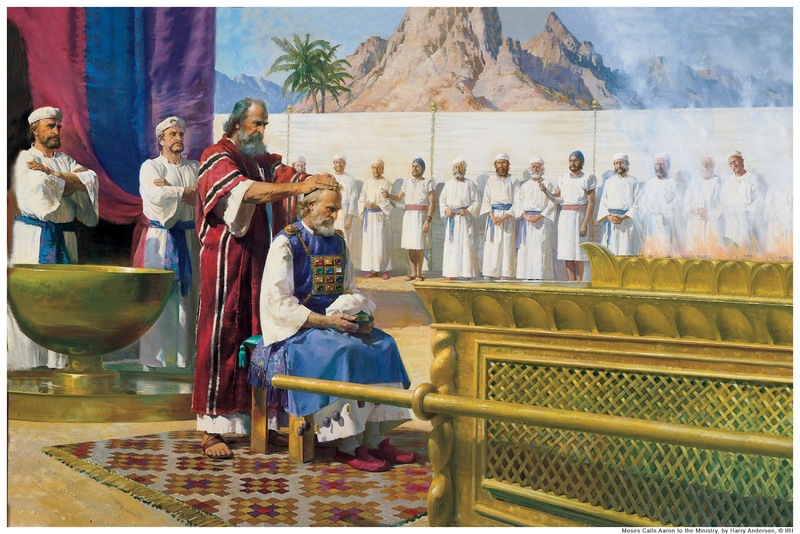 Why should we not consider it to be a big conceptual difference if the old covenant Scriptures, especially God's Law given to Moses (which is what the author of Hebrews is using throughout chapter nine to illustrate his point), don't ever describe priestly duties or sacrificial requirements in terms of a "will" or "testament"? As far as I can tell, there is absolutely no theology of "will-making" or "will-keeping" in the Mosaic law. But there are a lot of illustrations about "covenant-making", "covenant-ratifying", and "covenant-keeping". My own personal view is that if the theology of "covenant making" and "covenant ratifying" is understood within it's old covenant context of priesthood and sacrifice, this will help broaden our understanding of the "covenant" in the book of Hebrews. I do not personally believe that the bottom-line of the author's argument in Hebrews 9:16-18 is that Jesus died to inaugurate a necessary transition from an old "covenant" to a new "covenant." I do adopt that basic terminology, but I do not adopt many modern conceptions about the author's own use of that term. My understanding is that the bottom-line of 9:16-18 is that worshipers under the old covenant were required to ratify their covenant with God by offering the death of an animal as a substitutionary sacrifice, and that the earthly ministry of the Levitical priesthood was the only mediator between the death of that substitutionary victim and the worshiper. This is what the Law of God prescribed, and so this is what I believe the author of Hebrews is utilizing to prove his point. And so, by extension, because the Law required an earthly priesthood to bring forward the blood of animal victims into the presence of God, once Jesus enters the "true tabernacle" with His own blood (of which the earthly tabernacle was just a "shadow" and it's priestly ministry a "parable" according to 8:5 and 9:9), and offers it, and is received by God as satisfactory, there must of necessity be a transition from an old covenant priestly ministry to a new covenant priestly ministry. But it is precisely at this point that modern translations of Hebrews 9:16-18 are not able to make a direct connection between priesthood and covenant, which is what I firmly believe the author of Hebrews is describing all throughout chapters 8 and 9. All throughout the book of Hebrews, the author is not addressing some broad, sweeping change to God's "covenant" as it pertains to the means by which sinners "get saved" (e.g. the old covenant was salvation by law, but the new covenant is entirely of grace; the old covenant was based on works, but the new covenant is based on faith, etc.,). Instead, upon closer examination, what we find is that the author is addressing a specific change to God's "covenant" as it pertains to it's essential identification with Israel as a kingdom of priests. In other words, the author is addressing a specific change of priesthood and the essential ministry with which it is identified. Moreover, he is arguing that the Law itself anticipated this and taught this inevitable change in various ways, teaching the eventual necessity of changing from a continual sacrificial offering to the once-for-all-self-sacrifice of Jesus, from priests after the order of Levi to Jesus after the order of Melchizedek (Heb. chs. 5-7), from Moses and Aaron, Israel's Apostle and High Priest, to Jesus, the Apostle and High Priest of our confession (Heb. 3:1). In summary, this letter of Hebrews is about the royal priesthood of Israel as God's adopted "son" being lead to Jesus, the true Son of God, of which their priestly ministry and "sonship" was but a foreshadow. Unfortunately this necessary connection between "covenant" and "priestly ministry" becomes skewed in Hebrews 9:16-18 once the translation of a "will" or "testament" is applied. As a matter of fact, as soon as the word diatheke (which is the Greek word for "covenant", but translated as a "will" or "testament" in 9:16-18) enters into this letter of Hebrews, it functions within a context that is completely oblivious to the need for a "will" or "testament" to come into force. And as the author's discussion of diatheke continues from one thought to another, from chapter to chapter, the context still remains oblivious to any need for a discussion about a "will" or "testament." The first place diatheke is used in Hebrews is in 7:22, and the author begins a discussion about Christ becoming the guarantee of a "better covenant". But notice carefully that the context refers to a change in the law pertaining to the old covenant priestly administration. In the very next verses of chapter 7, verses 23 and 24, the author argues that "The former priests were many in number, because they were prevented by death from continuing in office, but he [Jesus] holds his priesthood permanently because he continues forever." The discussion of a "better covenant" never shifts away from that contextual understanding of priestly administration. Modern translations insert the word "covenant" in eleven places between 7:22 and 9:16, and yet the actual word diatheke (i.e. "covenant") is only found in eight of those places in the original Greek text. In the remaining three places (Heb. 8:7,13; 9:1), we find the beginning of an intentional conceptual parallel between the "first" covenant and the "first" priestly administration, between the "new" covenant and the "new" priestly administration. As I mentioned a moment ago, the author's first mention of a diatheke (i.e. a "covenant") is in 7:22 and it is speaking about a change of law pertaining to the old covenant priestly administration (i.e. "ministry"). The next occurrence of diatheke ("covenant") is in 8:6, which says that "Christ has obtained a ministry (i.e. a priestly ministry) that is as much more excellent than the old as the covenant he mediates is better, since it is enacted on better promises." Notice carefully that in the following verse, verse 7, the author begins the intentional conceptual parallel mentioned moments ago. Hebrews 8:7 says, "For if that first _______ had been faultless, there would have been no occasion to look for a second." Here, after the word "first", I have left a blank line for the purpose of showing where the author omits the word "covenant" found in modern translations. I believe the author has allowed this ellipsis, and is beginning a series of three successive ellipses, in order to help his audience make the conceptual connection themselves. In the larger context of Hebrews 8, the author has already begun a discussion about a "better covenant" in 7:22, referring to a change in priestly administration. Here in 8:6, he is discussing Christ as obtaining a priestly ministry through which which He mediates for those under the new covenant. The "first" that "had been faultless" was not simply a covenant. The author is talking about a priestly ministry under the old covenant. The first priestly ministry was "faulty," which is why the author can use the laws pertaining to it to illustrate a necessary change once the Messiah accomplishes redemption once for all. The same is true for the other two elliptical examples. In 8:13, the author says, "In speaking of a new ______, He makes the first ______ obsolete. And what is becoming obsolete and growing old is ready to vanish away." Again, one can just as easily insert the word "ministry" in each of the underlined areas, because the context of chapter eight, including the quotation from Jeremiah in verses 8-12, is describing the Lord's adoption of Israel as a royal priesthood by establishing a covenant with them at Sinai. What I am not saying dogmatically is that the word "ministry" should be inserted in those blank spaces. The word "covenant" is the proper syntactical insertion. My point, again, is simply that the author is intentionally associating the old "covenant" with the old priestly "ministry". Beginning at 7:22, the change in covenant is conceptually parallel with a change in priestly ministry. This becomes even more obvious when we consider the way he follows 8:13 with a description of the priestly administration in 9:1, which is the third and final example of intentional ellipsis: "Now even the first ________ had regulations for worship and an earthly place of holiness." At the end of the last post I briefly mentioned my desire to explain the peculiar insertion of the words "be carried" and "over dead victims" into my translation (above). I will save that explanation for the next post. But for now, assuming that my translation is defensible, I hope I have shed enough light upon this subject for others to consider whether my translation of 8:16-17 (above) fits better into the broader context of Christ obtaining a priestly ministry that is better than the old one. 1. An alternative would be to take the literal translation of "be brought forward" as a reference to the worshiper bringing his own representative animal sacrifice to the priest, who would then draw near to God by presenting the dead animal as an offering to Him. The worshiper has to bring an animal before the Lord and slaughter it representatively, because the law required the death of a substitute to "be brought forward" into the Lord's presence. 3. Latreia is used throughout the Greek translation of the Hebrew Old Testament (LXX) as a reference to the public ministry of priests. Some examples of latreia include Joshua 22:27 and I Chron. 28:13. Joshua talks about performing the "service (latreia) of the Lord in His presence with our burnt offerings and sacrifices and peace offerings." The Chronicler talks about "the divisions of the priest and of the Levites, and all the work of the service (latreia) in the house of the Lord." 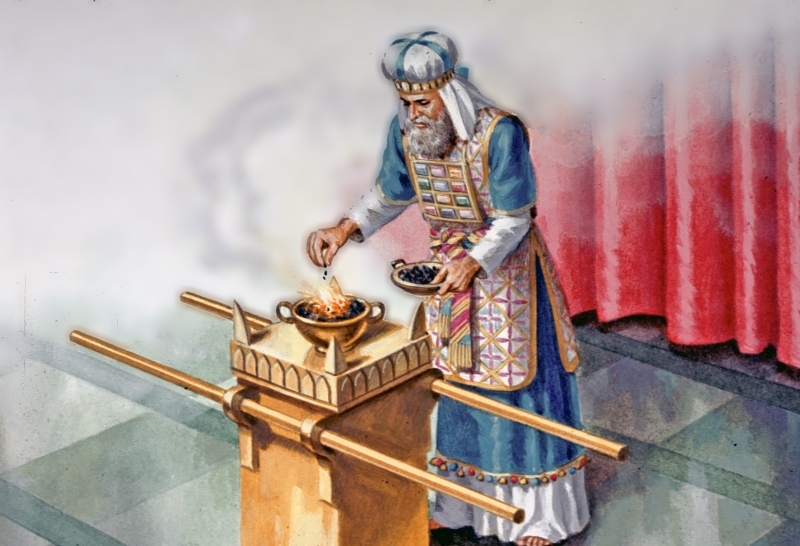 In Hebrews 9:6, the author says that "the priests go regularly into the first section, performing their ritual duties (latreia)."